MCM Training – Week 1 Tempo Run | So What? I run. Today our group was supposed to do a 4 mile tempo run for beginners and 5 – 6 for intermediates. Having had a crappy track workout on Tuesday, I decided to go with the 4 mile run on the “dreadmill.” It was obvious to me that I needed to get back to basics and work on my form and pace consistency. I’d let the treadmill take care of my pace while I concentrated on my form. I started with a 12 minute mile warm-up, followed by two 10 minute mile tempo, then a 12 minute mile cool down. While running I concentrated on engaging my core, which is very hard for me to do, and lighting my steps. When I get tired my feet clomp and I sound like Frankenstein. It’s so annoying, but once I get into what I call the “Clomping McClomping” mode, it’s tough for me to lighten up and break out of it. I was definitely clomping over the last week. Mile 1 was nice and easy, mile two, not so much. I tried to bump up my speed to 9:30, but my knee objected, so I took it back down to 10. I typically don’t warm up until mile 3, so once I hit mile 3, I really started to feel good…FINALLY! Slowing down for mile 4 was very tough. I started to feel good and I wanted to keep going, but I stuck with the program instead. Happy to have a successful training run (YAY ME! ), even though it was short and on the dreadmill. Things are looking up. Next run is Saturday’s long run…11 miles. 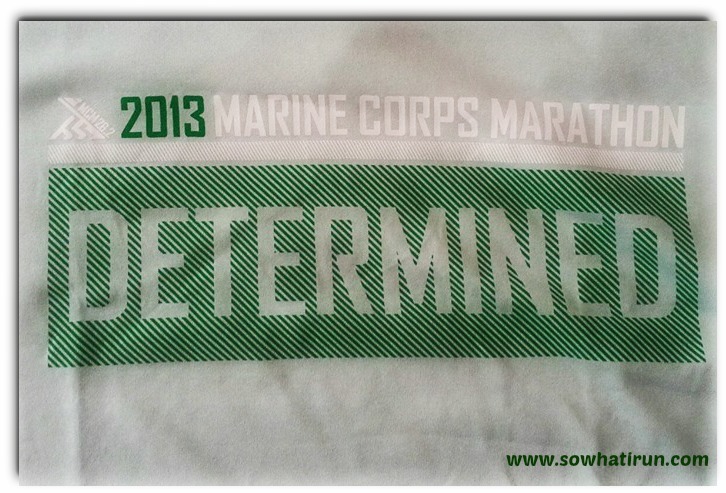 This entry was posted in Marathon Training, Running and tagged Marathon Training, marine corps marathon, Road Running, Running, Tempo run by SoWhatIRun. Bookmark the permalink. Hi Sue! I’m on an 18 week training program facilitated by a local running store, Charm City Run. I’m following their intermediate program, but if I’m not feeling well I sometimes drop down to their beginner miles. Definitely take it slow. Don’t need to get injured! Are you training with a group or on your own? Training with some girls from the group but not an organized training program, no. I LOVE Mom’s Run this town! I’m not a mom, but I belong to the one in Baltimore. Just got my virtual medal for July’s run! Whoohoo! The Alexandria/Arlington VA Chapter Leader! !